We will soon release CN II which has alot of improvements from CubieNOS. Jumper onboard to choose between no resampling up to 192 kHz or fixed resampling at 176.4 kHz. 2 Responses to "Sneak peak @ CN II"
The sneak peak cn 2 dac looks very promising. Does it engage a precise and low noise powered masterclock? Is it possible to experiment with psu’s? I ask this, because I’ve recognized the rectifiers on the board- so power filtering and regulation is complete on board? That would mean it accepts only AC-power as an input and this would kill the chance of upgrading through psu- tuning. Like CN1 Is CN2 built around a Philips NOS chip. Those chips don’t need a master clock to operate. 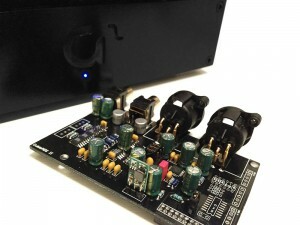 So the master clock generated from The S/PDIF interface is not connected to the DACs. You can use any PSU of your choice as long as it is providing 12V DC and more than 200mA. In that case you have to replace the 12V pre-regulator you can see the small pcb on the front edge of the board in the picture right angel mounted to the main board.